Dayco Ambassador David Russell, together with long-term GT racing partner Roger Lago and Supercar racer Todd Hazelwood, have started the 2019 Australian motor racing season off with an impressive top 10 finish in the 2019 LIQUI MOLY Bathurst 12 Hour. Competing for the first time with Matt Stone Racing in an Audi R8 LMS that both Russell and Lago had only first driven one week before the event, the trio’s result of ninth place overall saw them out-perform a number of local and international Pro Am category teams, finishing second in the Pro-Am standings to major international team AF Corse (Ferrari) and a clear two laps ahead of the rest of the 38-car field. 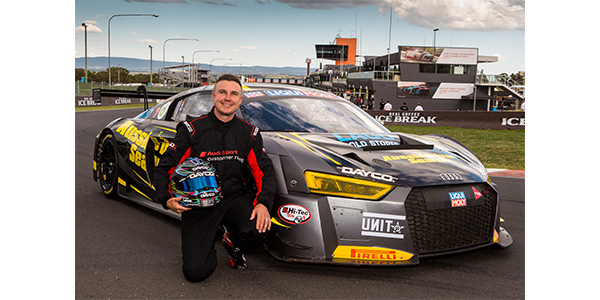 Russell, Lago and Hazelwood’s performance at Bathurst also earned the Matt Stone Racing team the highest-placed Audi honors at this prestigious event, surpassing all of the factory-supported teams. The race covered a record 312 laps (1,938km) this year and was held in hot conditions, with an average lap speed of 161kph, which represented another new event record. “That was a great race, it was flat out all the way and the team performed brilliantly,” David Russell said. “All three drivers were consistent, fast and error free – the car looks as straight and perfect as when it arrived. “I’m a bridesmaid once again in the Pro-Am class and it was a major international GT team that finished ahead of us, with the rest of the field a long way behind. I look forward to coming back next year to try and take the Pro-Am win. I am very proud of our result as the first time we drove this car was just one week before the race. We all came to grips with it immediately and we were able to extract the best from it,” Russell said. The Dayco sponsored driver will return to Mount Panorama to compete in the opening Pirtek Season of Endurance Supercar event, the Bathurst 1000 this October. This event marked Russell’s 11th Bathurst 12 Hour, his third Pro-Am podium result and sixth overall top 10 result in this race. It continues the Dayco sponsored driver’s remarkable tally of class wins and podiums in every format of Bathurst GT or Production car racing during his career.